After driving across country so much you become a pro at knowing what you'll want while out on the road. So, I thought I would share my must haves with you guys today. My Phone - This is what we use to keep track of where we are going, work emails, keep family/friends up to date on where we are, and pretty much any other internet thing. Coffee - We tend to leave early in the morning well before I am really awake, so a good cup of coffee is a must have for me. And by a good cup of coffee I mean whatever is at the first gas station we hit. Man, I wish the coffee was consistent from gas station to gas station, it's surprising how bad it can be some times, haha. Our Camera - We always like to have this guy on hand for any photo ops that may arise. I'm pretty excited about this trip because we are going to take our time driving up north to visit our friends. I'll be finding lots of things to stop and take pictures of. Entertainment Weekly - I've stopped reading the most recent ones so I will have a little stockpile to read in the car. A lot of time we will read the articles to out loud so the driver can be entertained. It might sound silly but we get a kick out of it. Snacks - While I "try" my best to pick up healthy snacks for our driving days I usually cave in at the second or third gas station and just get some candy: Gardettos and some Jerky for Will. I just can't help it, when I am sitting in a car for 10+ hours day in and day out I want junk food! Blanket - 90% of the time my toes are like icicles so I like to have a blanket in the car to help warm them up. Audio Books - I love audio books when driving (unless I am in the middle of a busy area and have to pay attention). They help make the time just fly by. Some of my favorite audio books are a part of Clive Cussler's Dirk Pitt series. They are just wonderfully silly books about a billionaire adventure that is always finding trouble with his best bud Al Giordino, and sometimes they run into the author Clive Cussler on their adventures haha! It's so delightful. 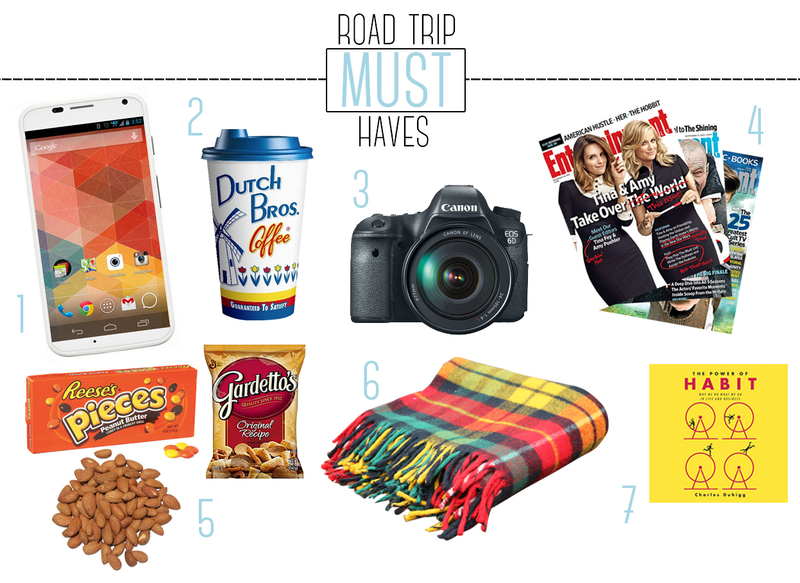 Are there things you have to have on a road trip? I love hearing all the different things people like to take with them so leave a comment below! I feel like your necessities and mine overlap quite a bit. I use my iphone to stream podcasts and I am completely guilty of reading the EWs aloud to the driver. Also, whenever we go anywhere, my boyfriend INSISTS on buying a giant slim jim for the ride. What is it with boys and jerky? Love this list! I've always wanted to try out audio books for a road trip. I love to road trip, Its a new passion of mine since last summer, this summer my boyfriend and I are trying to do another week road trip and I totally think your list in genius. I LOVE audio books. We listened to them a lot on roadtrips when I was growing up. We'd always borrow them from a Cracker Barrel because you can return them to any other Cracker Barrel -- and those are on every other exit in the South! I've convinced my husband to try out an audio book with me on our road trip to Florida in a few weeks, still haven't picked out one though! YES! For reading EW's out loud to the driver! It's pretty much the best. And I swear the only time Will ever gets jerky is on a road trip, so weird. You should seriously try out an audio book on a road trip, they can be so much fun! Road trips are just are so much fun! Hope you guys are able to do another one this coming summer. What?! You can borrow them from a Cracker Barrel?! That's amazing! I'm going to have to see if we have any Cracker Barrels on our usual routes. Thanks for the great tip! Road trips are my ideal mode of travel. Audio books are such a great idea, never thought of that. Thanks for the suggestions. Is that a legitimate actual photo of your phone? Because I have the EXACT same background on mine right now! Yes it is, looks like we are twinzies!! Hehe!